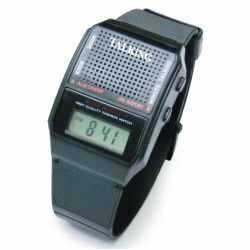 A very well designed basic English talking watch, and quite useful for those times when you cannot easily look at a display (dark movie theater, etc). In addition to speaking, it has a 1/4 inch easy to ready standard display. Plastic band length is about 9 inches. Comes with 2 installed Alkaline button cells LR110, easily replaceable if ever needed later. Also known as AG10, 389A, etc. The elderly or vision impaired will love this, so its extremely practical. Campers and backpackers opt for these on occasion, as well. Many buyers have reported ordering English talking watches online that are military (1-24 hour) time and have, of course, been disappointed. Those are ok for foreign use, like in South America, but are useless for the U.S. or Canada. So, just to clarify, this is good old 12 hour American time format (midnite to noon, to midnite). Last, but hardly least, many have bought these as gifts for friends or relatives from other countries as a language learning tool. It's a practical gift item for birthdays or holidays too.. Thanks for looking in ! Multiple alarm sounds: rooster crow, cuckoo, techno, beep.